Patients are prescribed an IV solution (fluids) based on their electrolyte and fluid volume status. IV fluids are commonly categorized as colloids and crystalloids. Colloid solutions contain large molecules that cannot pass through semi-permeable membranes and are used to expand intravascular volume by drawing fluid from extravascular space via high osmotic pressure. Examples of colloid solutions are albumin, dextrans, and hydroxyethyl starches (Crawford & Harris, 2011). Crystalloid solutions contain solutes such as electrolytes or dextrose, which are easily mixed and dissolvable in solution. Crystalloids contain small molecules that flow easily across semi-permeable membranes, which allows for transfer from the bloodstream into the cells and tissues (Crawford & Harris, 2011). They may increase fluid volume in interstitial and intravascular space. Examples of crystalloid solutions are isotonic, hypotonic, and hypertonic solutions. Isotonic solutions have an osomolality of 250 to 375 mOsm/L. Isotonic solutions have the same osmotic pressure as plasma, creating constant pressure inside and outside the cells, which causes the cells to remain the same (they will not shrink or swell) and does not cause any fluid shifts within compartments. Isotonic solutions are useful to increase intravascular volume, and are utilized to treat vomiting, diarrhea, shock, and metabolic acidosis, and for resuscitation purposes and the administration of blood and blood products. Examples of isotonic solutions include normal saline (0.9% sodium chloride), lactated Ringer’s solution, 5% dextrose in water (D5W), and Ringer’s solution. It is important to monitor patients receiving isotonic solutions for fluid volume overload (hypervolemia) (Crawford & Harris, 2011). Hypotonic solutions have a lower concentration, or tonicity, of solutes and have an osomolality equal to or less than 250 mOsm/L. The infusion of hypotonic solutions lowers the osmolality within the vascular space and causes fluid to shift to the intracellular and interstitial space. Cells will swell but may also delete fluid within the vascular space. Examples of hypotonic solutions include 0.45% sodium chloride, 0.33% sodium chloride, 2.5% dextrose in water, and 0.2% sodium chloride. Monitor for hypovolemia and hypotension related to fluid shifting out of the vascular space, and do not administer to patients with increased intracranial pressure (ICP), as it may exacerbate cerebral edema. Use cautiously in patients with burns, liver failure, and traumas (Crawford & Harris, 2011). Hypertonic solutions have a higher concentration, or tonicity, of solutes and have an osomolality equal to or greater than 375 mOsm/L. The osmotic pressure gradient draws water out of the intracellular space into the extracellular space. Examples of hypertonic solutions include D5W and 0.45% sodium chloride, D10W, and 3% sodium chloride. Hypertonic solutions may cause intravascular fluid volume overload and pulmonary edema, and they should not be used for an extended period of time. Hypertonic solutions should not be used in patients with heart or renal disease who are dehydrated (Crawford & Harris, 2011). Read the article IV fluids: what nurses need to know for more in-depth information regarding colloid and crystalloid solutions. Although all IV fluids must be administered carefully, hypertonic solutions are additionally risky. The most common types of solutions include normal saline (NS) and D5W. Patients may also have medications, such as potassium chloride, thiamine, and multivitamins, added to IV solutions. To discontinue an IV infusion, an order must be obtained from the physician or nurse practitioner (Perry et al., 2014). 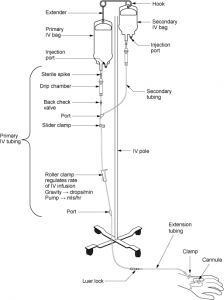 When a peripheral vein has a cannula inserted, an extension tubing is connected to the hub on the cannula and flushed with normal saline to maintain patency of the cannula. Most peripheral intravenous cannulas will have extension tubing, a short, 20 cm tube with a positive fluid displacement/positive pressure cap attached to the hub of the cannula for ease of access and to decrease manipulation of the catheter hub (Vancouver Coastal Health, 2008). The extension tubing must be changed each time the peripheral catheter is changed. When the peripheral cannula is not in use, the extension tubing attached to the cannula is called a saline lock. 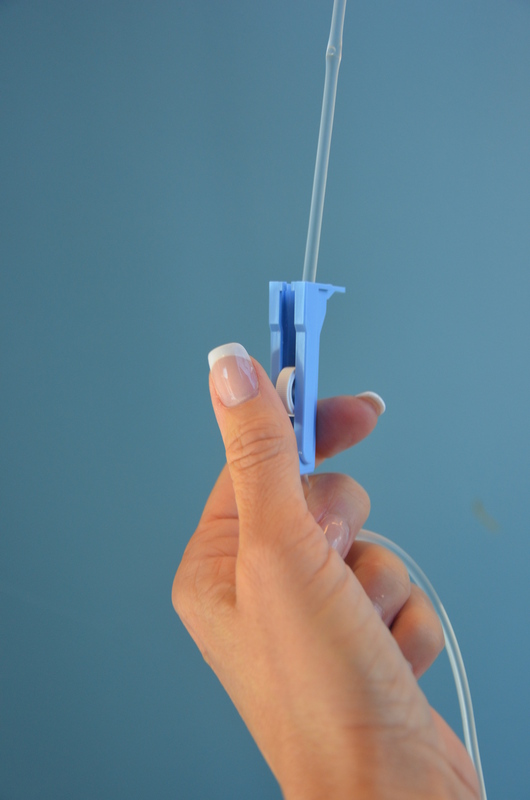 Intravenous fluids are administered through thin, flexible plastic tubing called an infusion set or primary infusion tubing/administration set (Perry et al., 2014). The infusion tubing/administration set connects to the bag of IV solution. Primary IV tubing is either a macro-drip solution administration set that delivers 10, 15, or 20 gtts/ml, or a micro-drip set that delivers 60 drops/ml. 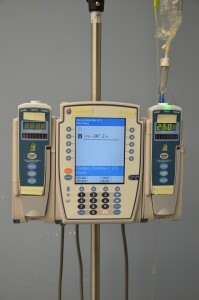 Macro-drip sets are used for routine primary infusions. Micro-drip IV tubing is used mostly in pediatric or neonatal care, when small amounts of fluids are to be administered over a long period of time (Perry et al., 2014). The drop factor can be located on the packaging of the IV tubing. Secondary IV tubing: Shorter in length than primary tubing, with no access ports or backcheck valve; when connected to a primary line via an access port, used to infuse intermittent medications or fluids. 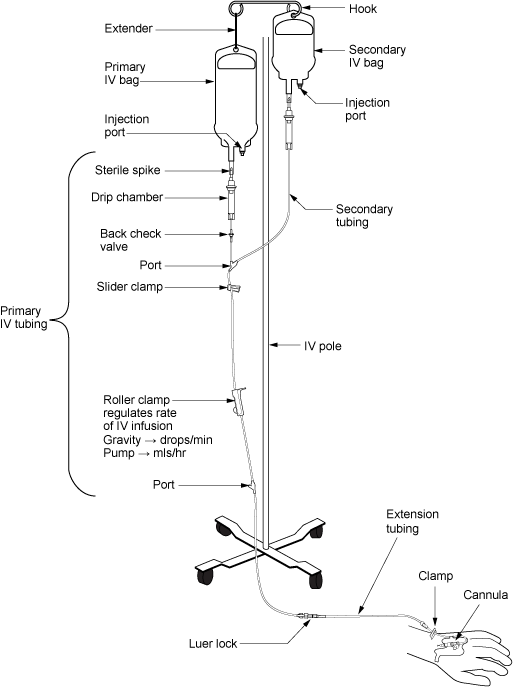 A secondary tubing administration set is used for secondary IV medication. Primary and secondary administration sets (see Figure 8.4) should be changed regularly to minimize risk and prevent infection (CDC, 2011; Fraser Health Authority, 2014). Change IV tubing according to agency policy. Table 8.5 lists the frequency of IV tubing change. All IV tubing must be changed using sterile technique. IV tubing is changed based on the type of tubing, time used, and the type of solution. If possible, coordinate IV tubing changes with IV solution changes. Every 72 -96 hours Primary tubing with hypotonic, isotonic, or hypertonic continuous solution, when insertion site is changed, or when indicated by the type of solution or medication being administered. Every 24 hours Secondary or intermittent IV solution or medication. Rationale: When an intermittent infusion is repeatedly disconnected and reconnected for infusion, there is increased risk of contamination at the catheter hub, needleless connector, and the male Luer end of the administration set, potentially increasing risk for CR-BSI. Every 24 hours Infusions containing fat emulsions (IV solutions combined with glucose and amino acids infused separately or in a 3 in 1 admixture). Example: Total parenteral nutrition (TPN). 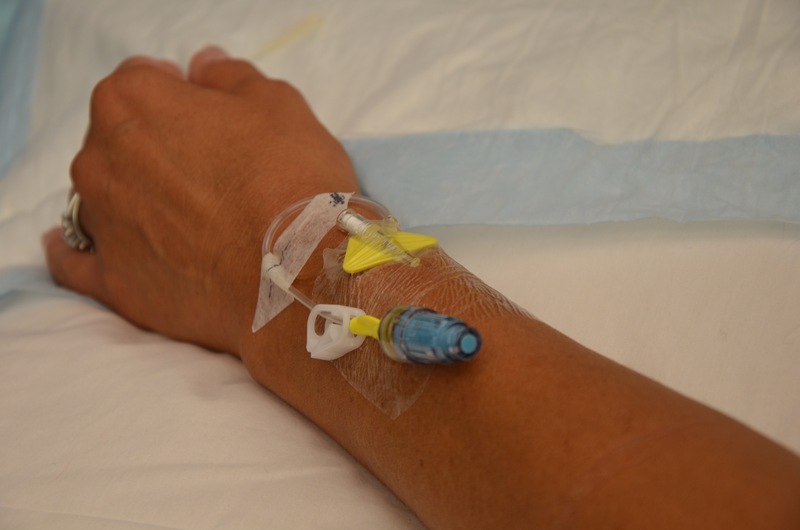 To ensure therapeutic effectiveness of IV fluids, a constant, even flow is necessary to prevent complications from too much or too little fluid. A physician must order a rate of infusion for IV fluids or for medications. The rate of infusion for medications (given via a secondary or primary infusion) can be found in the Parenteral Drug Therapy Manual (PDTM). If an order for IV fluids is “to keep vein open” (TKVO), the minimum flow rate is 20 to 50 ml per hour, or according to physician’s orders (Fraser Heath Authority, 2014). Gravity. 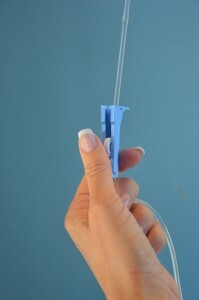 The health care provider regulates the infusion rate by using a clamp on the IV tubing, which can either speed up or slow down the flow of IV fluids. An IV flow rate for gravity is calculated in gtts/min. Electronic infusion device (EID) (see Figure 8.5). The infusion rate is regulated by an electronic pump to deliver the fluids at the correct rate and volume. All IV pumps regulate the rate of fluids in ml/hr. An IV pump (EID) is used for many types of patients, solutions, and medications (Vancouver Coastal Health, 2008). To calculate the drops per minute for an infusion by gravity, follow the steps in Table 8.6. Example 2. Give 1000 ml of NS IV over 8 hours. 2. Determine the drop factor on the IV administration set. The drop factor is the amount of drops (gtts) per minute. IV tubing is either macro tubing (10, 15, or 20 gtts/min) or micro tubing (60 gtts/min). The drop factor (or calibration of the tubing) is always on the packaging of the IV tubing. To calculate ml/hr, divide 1000 ÷ 8 = 125 ml/hr. 4. Regulate IV infusion using the roller clamp. Observe and count the drips in the drip chamber and regulate for 42 gtts/min (one full minute). Alternatively, divide 42 by 4 (rounded down from 10.4 to 10 gtts/min) to count for 15 seconds. The gtts/min should be assessed regularly to ensure the IV is infusing at the correct rate (e.g., every 1 to 2 hours, if the patient accidentally bumps the IV tubing, or if a patient returns from another department). Take the IV calculations quiz for more practice with IV fluid dose calculation. When an infusion is by gravity, there are several factors that may alter the flow/infusion rate (Fulcher & Frazier, 2007). In addition to regulating the flow rate, assess the IV system to ensure these factors are not increasing or decreasing the flow of the IV solution. These factors are listed in Table 8.7. Tube occlusion May occur if the tubing is kinked or bent. Tubing may become kinked if caught under the patient or on equipment, such as beds and bed rails. Vein spasms Irritating or chilled fluids (fluids stored in the fridge) may cause a reflex action that causes the vein to go into spasm at or near the intravenous infusion site. If fluids or medications are chilled, bring to room temperature prior to infusion. Height of the fluid container The IV tubing drip chamber should be approximately 3 feet above IV insertion site. Location/position of IV cannula If the cannula is located in an area of flexion (bend of an arm), the IV flow may be interrupted when the patient moves around. To avoid this issue, replace IV cannula. Infiltration or extravasation If the cannula punctures the vein, the fluid will leak into the surrounding tissue and slow or stop the flow, and swelling will develop. Accidental touching/bumping of the control clamp or raising arm above heart level Instruct the patient not to touch the roller clamp and to take care not to bump the clamp, as this may accidentally change the flow rate. Instruct patient to keep hand/arm below heart level; an elevated hand/arm will slow or stop an infusion running by gravity. Needle or cannula gauge/diameter The smaller the needle or cannula, the slower the fluid will flow. All patients with IV fluid therapy (PIV and CVC) are at risk for developing IV-related complications. The assessment of an IV system (including the IV site, tubing, rate, and solution) (see Figure 8.6) often depends on what is being infused, the patient’s age and medical condition, type of IV therapy (PIV or CVC), and agency policy. Generally, an IV system should be assessed as described in Checklist 65. IV systems must be assessed every 1 to 2 hours or more frequently if required. 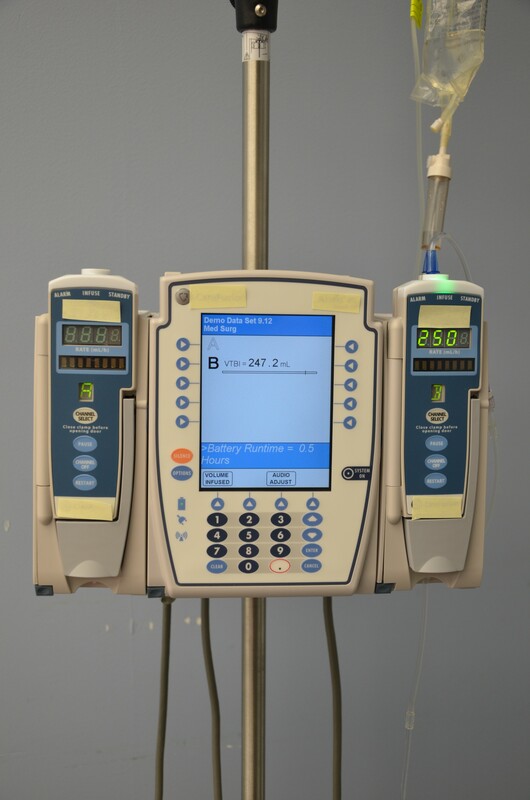 An IV system should be assessed at the beginning of a shift, at the end of a shift, if the electronic infusion device alarms or sounds, or if a patient complains of pain, tenderness, or discomfort at the IV insertion site. 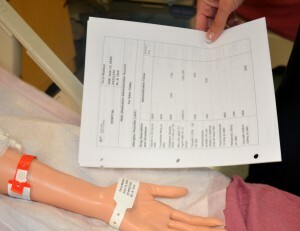 Review the patient’s chart to determine insertion date and type of solution ordered. A peripherally inserted catheter is usually replaced every 72 to 96 hours, depending on agency policy. If the peripheral catheter or central venous catheter is not in use, or is being used intermittently, flushing is required to keep the site patent. Refer to agency policy for flushing guidelines. A not-in-use peripheral IV site is generally flushed every 12 hours with 3 to 5 ml of normal saline. Review the in-and-out sheet to determine expected amount in the IV solution bag. Patients with cardiac or renal disease, as well as pediatric patients, are at a higher risk for IV-related complications. Elderly patients often have fragile veins and may require closer monitoring. 1. Perform hand hygiene. This step reduces the transmission of microorganisms. 2. Introduce yourself and explain the purpose of the assessment. This builds trust with patient and allows time for the patient to ask questions. 3. Confirm patient ID using two patient identifiers (e.g., name and date of birth), and compare the MAR printout with the patient’s wristband. This step ensures you have the correct patient and complies with agency standard for patient identification. 4. Apply non-sterile gloves (optional). This reduces the transmission of microorganisms. 5. Assess the IV insertion site and transparent dressing on IV site. Check IV insertion site for signs and symptoms of phlebitis or infection. Check for fluid leaking, redness, pain, tenderness, and swelling. IV site should be free from pain, tenderness, redness, or swelling. Ensure patient is informed to alert the health care provider if they experience pain or notice swelling or redness at the IV site. If patient is unable to report pain at IV site, more frequent checks are required. 6. Inspect the patient’s arm for streaking or venous cords; assess skin temperature. Assess complications on hand and arm for signs and symptoms of phlebitis and infiltration/extravasation. 7. Assess IV tubing for kinks or bends. Kinks or bends in tubing may decrease or stop the flow of IV fluids. Ensure tubing is not caught on equipment or side rails on bed. Tubing should be properly labelled with date and time. 8. Check the rate of infusion on the primary and secondary IV tubing. Verify infusion rate in physician orders or medication administration record (MAR). If IV solution is on gravity, calculate and count the drip rate for one minute. If solution is on an IV pump, ensure the rate is correct and all clamps are open as per agency protocol. If secondary IV medication is infusing, ensure clamp on secondary IV tubing is open. The EID is unable to distinguish if the primary bag or secondary bag is infusing. 9. Assess the type of solution and label it on bag. Check volume of solution in bag. IV solutions become outdated every 24 hours. Ensure the correct solution is given. If 100 ml of solution or less is left in the bag, change the IV solution and document on in-and-out sheet. If an IV pump is used, ensure it is plugged into an outlet. Ideally, the IV solution should be 90 cm above patient heart level. 10. Assist patient into comfortable position, place call bell in reach, and put up side rails on bed as per agency policy. These precautions prevent injury to the patient. 11. Perform hand hygiene. This step prevents the spread of microorganisms. 12. Document procedure and findings as per agency policy. Timely and accurate documentation promotes patient safety. What are the signs and symptoms of phlebitis? What types of patients should not receive hypotonic IV solutions? 8.3 IV Fluids, IV Tubing, and Assessment of an IV System by British Columbia Institute of Technology (BCIT) is licensed under a Creative Commons Attribution 4.0 International License, except where otherwise noted.